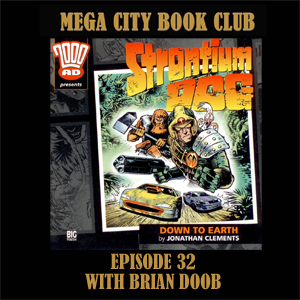 Brian Doob from the British Invaders science fiction podcast is my guest and he's thought outside the box and chosen two splendid Strontium Dog full cast audios from Big Finish. Check out Brian's new Hooked on Bond podcast. You can find the 2000AD audio range at BigFinish.com or audiobooks.com. An interesting podcast! I'm more than slightly obsessed with the strontium dog audiodramas, so it's great to hear people still talking about them. Pre-emptive revenge is actually my favorite audiodrama out of all of them, especially Johnny and Dredd's interactions being fleshed out. Interesting facts about sick squid's VA. I never actually knew most of this stuff, like being the executive producer and doing the dalek voices as well lmao. It's a pretty funny thought, and I absolutely agree that the interplanetary teleportation part was my favorite part of Down to Earth. Or possibly the mental image of McNulty in a flight attendant's outfit.